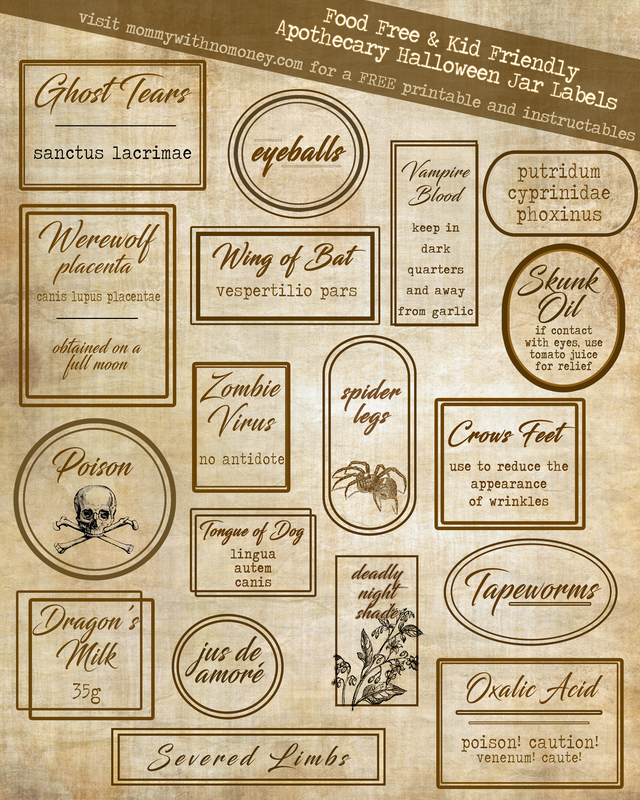 Have you ever thought those apothecary jars look amazingly creepy and just really cool to incorporate for your Halloween decor? Have you ever read up on what kinds of things go into them?! Have you ever thought, “Gross, what if my crazy toddler touches one of those and breaks it onto the floor – what kinda mess would I be cleaning up and what kind of smell would go with it?” Well, something similar happened to me last year, actually. I had an entire collection of apothecary jars that I made a few years ago. They included food items like, cauliflower, pickled onions and condiments from my fridge. They looked AMAZing, but let’s just say when I left them in my garage for an entire winter and opened them up for Halloween, I was blasted with a nasty smell and mold throughout my entire Halloween bin. This is my first time having a garage, so I thought it would be warm enough for them to stay in there. Nope, all the jars froze and then exploded …..UGH. So, I decided for my next jars that I will not be experimenting with food, so that if they broke again, I wouldn’t have a disgusting mess to clean up. Coming up with non-food ideas was a lot more challenging than I thought it would be and I’m not gonna lie, they don’t look AS spooky as my other ones, but I’d like to never smell that stench again. You’ll need some jars and containers-preferably glass as they will look more authentic, but if you’ve got kids and want to keep it safe, you could use any see through container. You can purchase sciency (that’s not a word and my husband (the science teacher) would mock me for putting that in there) but yes, purchase science-like jars from Amazon in the “Business, Industry and Science” section. You can buy used ones, which are cheaper and it’s not like you’re eating from them (oh and if you think these would be cool to put food items in for a Halloween party – DON’T DO IT! These kinds of flasks were probably used with chemicals and could be very harmful if ingested, even if thoroughly washed. Once you’ve received your order of jars, wash them really good before you put anything into them (again, some chemicals that may have been used, could react with other items you are putting in, so be safe and wash them. WOW! Thanks Amazon, that was fast! Now, wash your jars…..do it….do it NOW! Once you’ve printed your labels, cut them out and match them to your containers to see what will fit best (before you start putting things in them). You can rough up your glass containers with a coarse sandpaper, if you want. I did it to a couple jars. You could also brush on some brown paint and then wipe it off, giving it a little bit of the antique look to it. Alright, let’s start making some creations!! Zombie Virus: Neon Green Nailpolish. What a great use to put that ugly nail polish to use. I have had this color laying around for years and never used it. You could even use Neon Yellow or Orange. Who really knows what color a Zombie Virus is?! Jus de Amoré: Latin for Love Potion – Water, Food Coloring & Glitter. I added some dish soap to make a bubbly effect, potion effect but that probably wont last very long. My potion was too dark and you could barely see the glitter. It has to be mixed often to see the glitter, so possibly watered down glitter glue would work better? Deadly Night Shade: Dollar store flowers painted purple. I am sure if you can find purple flowers, this would be a time saver, but I didn’t have time to look and I used whatever I had left over in my craft room. Tapeworms: Use a glue gun and make squiggly lines on a surface where you can peel the glue once it’s dry. I glued the glue to the lid so it wouldn’t slide around inside the bottle, as you can see in the top right picture. Wing of Bat: Purchase plastic bats from the Dollarstore and cut their wings off. Tongue of Dog: I really wish I could of thought of something disgusting and gross to go into this jar, but all I can come up with is food items. If you have any ideas that would work, I’d love to hear them! Severed Limbs: I took plastic Dollarstore fingers and put them in a wine glass. Serves the purpose. If you have a bigger jar, take a skeleton specimen and shove it in the jar. Write a label stating “Experimentation 46 – Human Specimen turned Possessed Clown” or something to that effect. You can wrap burlap, wax paper, string, rope, cork or tissue paper around the top of the bottles to give a vintage look. Make sure to crazy glue all the tops into the bottle, so that if tipped on their side, nothing will pour out. Well, I hope you have fun making these and if you have any other ideas for a food-free option, please comment below! !